A roof is one of the most essential components of a home. When it’s damaged, the property is exposed to moisture damage, leading to an unpleasant environment and the need for repairs. Sometimes, these structures can’t be salvaged, calling for a new roof installation. Below is a guide so you can determine which solution is appropriate. 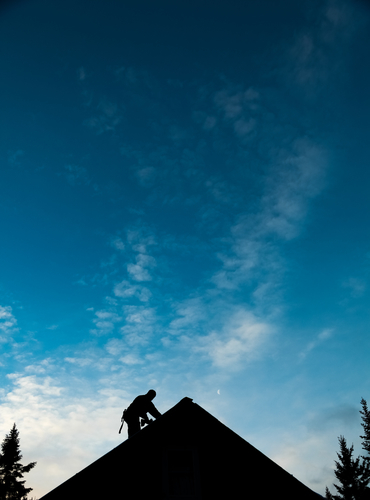 If your most recent roof inspection turned up missing shingles or other minor problems, repairs might be the way to go. This is only the case when the missing components are in an inconspicuous area, as leftover shingles will look different than those that have been on your roof for some time. Another consideration to make is how widespread the damage is. If it’s confined to one area of the roof, repairs may be sufficient, but if there are multiple problem areas, replacement may be necessary. Be sure to take a look at the interior as well to check for moisture damage. Small, contained roofing leaks can be repaired but where there’s severe water damage, replacement might be your only option. There are, however, a few problems that cannot be patched up with repairs. As mentioned above, conspicuous or extensive shingle damage will require a full roof replacement. Numerous punctures or holes, damage from fallen tree branches, or a roof that was poorly installed in the first place will all most likely call for replacement as well. If you’re ever in doubt about whether you should go with repairs or a new roof installation, have a contractor do an inspection to determine the right approach. If you’re looking for roofing experts in the La Crosse and Rochester areas, Interstate Roofing & Waterproofing located in Onalaska, WI, is the way to go. They work with residential and commercial clients, providing roofing installation, waterproofing, and other roofing services. Contact them today at (608) 783-2106 or visit their website to learn more.